Recruitment specialist Douglas Scott held its AGM earlier this year, which was managed by agency Team Spirit. The event, which took place on 22 January, needed to include a conference, teambuilding element and celebratory gala dinner for 65 delegates. Team Spirit’s venue-finding team recommended Cheshire’s Thornton Manor for the event, which provided a stunning backdrop for the conference, indoor and outdoor activities, hospitality and stylish accommodation. 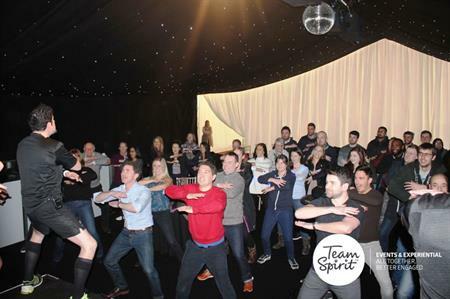 After arrival refreshments, served in a lakeside marquee, Team Spirit surprised delegates with a dramatic entrance, launching into The Haka – a 30-45 minute interactive dance teambuilding session. Following a series of business updates, delegates were transferred to the main house where Team Spirit hosted a bespoke adaption of the themed ‘CSI Investigates’. After a theatrical storyline scene setter, using professional actors, the complex murder plot unravelled, with teams of delegates interviewing suspects, attending a press conference and post-mortem and searching the house and grounds for clues. Commenting on the surprise entrance, Jon Nolan, director at Douglas Scott said it was "an awesome and upbeat" start to the day. "We were taken completely by surprise as an authentic looking scrum of ‘All Blacks’ burst into the room to teach us The Haka. Months later, we’re still breaking into impromptu renditions of 'Ka Mate! Ka Mate! Ka ora! Ka ora!'" The company’s CEO Kath Riley, added: "From the pre-event consultancy that helped Team Spirit understand our business and ROE objectives, to the astonishing attention to detail – nothing was too much trouble. Not only was the AGM hugely rewarding and memorable, it was great fun, too."